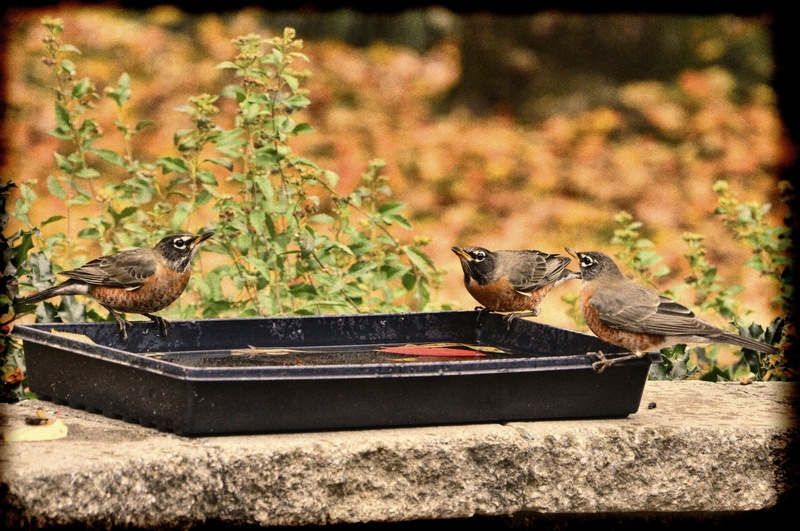 in late November are robins. Well, about two weeks ago my backyard was filled with them. I have rarely seen any robins in our backyard. Primarily, they hop around in our front yard. Don't know why they are not attracted to my backyard. Maybe they are camera shy. 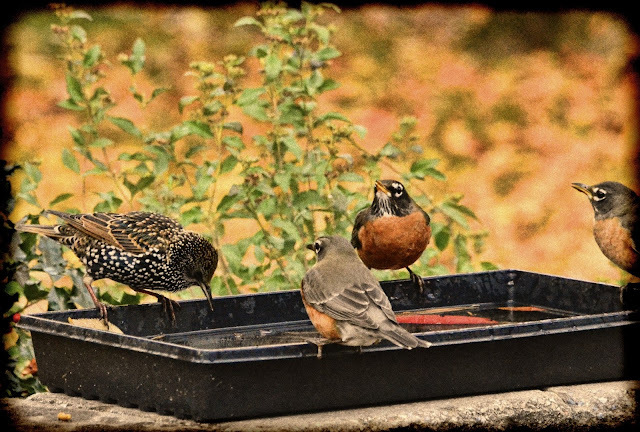 were busy taking turns drinking from my makeshift bird bath. I was surprised to see a few starlings among them. 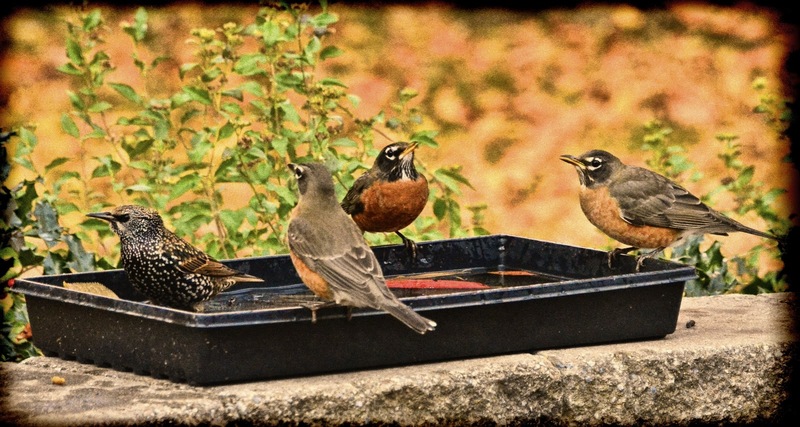 Guess the robins don't mind keeping company with them. All were mighty thirsty and spent a lot of time taking turns drinking. Maybe the starlings led them here. that I fed this summer. There were the typical disagreements on who got to bathe when. But in the end, it all worked out and all was right with the world. 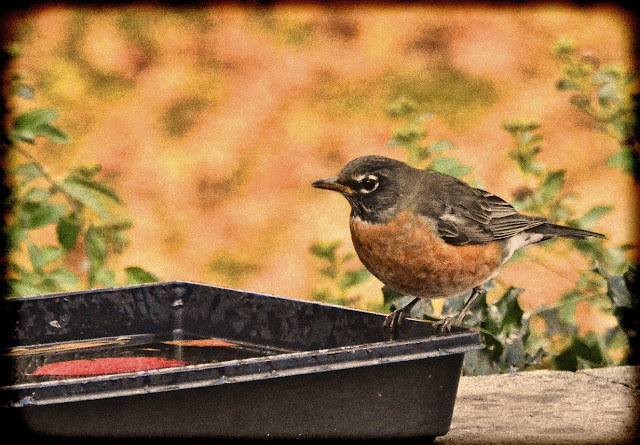 I used Topaz Adjust's Film Collection Vintage Grunge II on these photos. I'm having a lot of fun trying out their latest release. but the editing for me is the fun part. seeing the originals instead of these edited versions. I promise to mix it up soon and throw in some SOOC! She's back! Guests are fun, but quiet time with the birds is always good. Reena, these are great photos! Aren't they fun to watch? I love that shot where they are squabbling! Funny thing, mine uncharacteristically visited the back yard, too. Love the captures of the 'argument'! And I do like the treatment you used on these. i had flocks heading thru here too last week. same thing - hung around the baths, all sipping like mad, then off they went again! these are great shots, as always! Our robins tend to stick around between March and early December. I'm sure they're still here for the duration but they hide well for the true winter. Your images, as always, are gorgeous. Your home must be on the must visit map for birds. hope you had a great thanksgiving...what a gift to have all of them stop in for a drink and to check on you...smiles...very cool pics! HI Renna...Have fun with your photo's I like them ..I never know what to expect when I come to your post!! These are great and funny to !! We usually have a few Robins that hang out here all winter and feed on apples and berries..don't know quite why!! The back-and-forth of those birds, you captured beautifully. same thing here....i NEVER see them in late fall and i had dozens as well. they are gone now....they will return in spring. i can't wait to see them!! They are all delightful. You have a bird cafe going. Love it. Love these images. I agree, kinda strange to see all this activity in late November. Great treatments. I'm also hooked on Topaz, so much fun! lovely to see your small birds. I don't have much variety close to home because of the many more aggressive bird types in this area who are very territorial. Hi there - nice robins - and very different from the ones in the UK and in Australia. Good Morning, Reena! Wonderful captures of the robins. The are year round residents here in Maryland. I do not always see them, once in awhile they pop in for a visit. Great photos. Have a great day! Great pictures and I love your editing! We rarely see Robins in our yard during the winter but I've noticed over the years that I see groups of them in the mountain. You get such great 'drinking' shots. 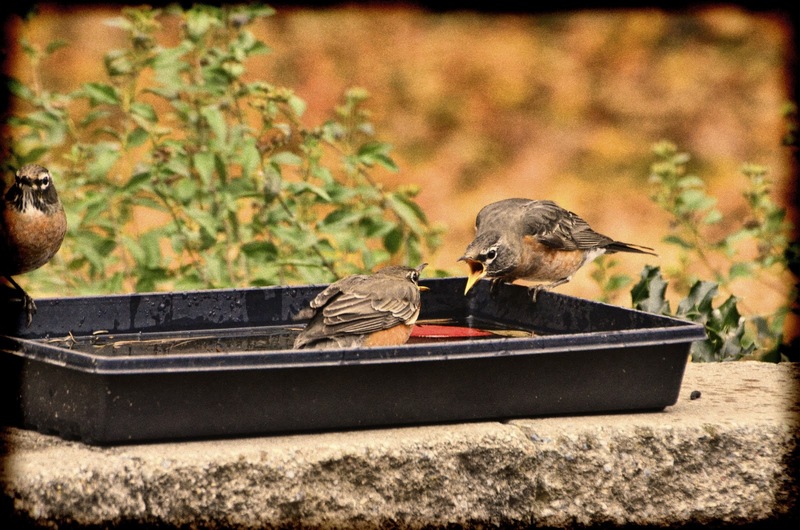 I bought a bird bath earlier this year but so far the birds have been avoiding it and the only ones drinking from it are the squirrels! What fun!! Who'd of thought you'd find so many robins at this time of year?!?!? 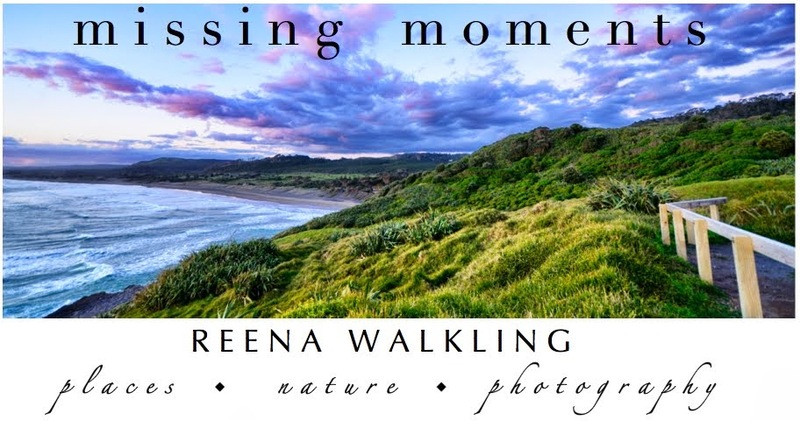 Fantastic photos, Reena! I happen to like your editing. It's nice to see something different from time to time. Nice job! You got some action shots, too :) Very cool! Have a great Wednesday! they look like they are having a blast, i showed the photos to my from PA hubby. we don't have these here. Wonderful editing! 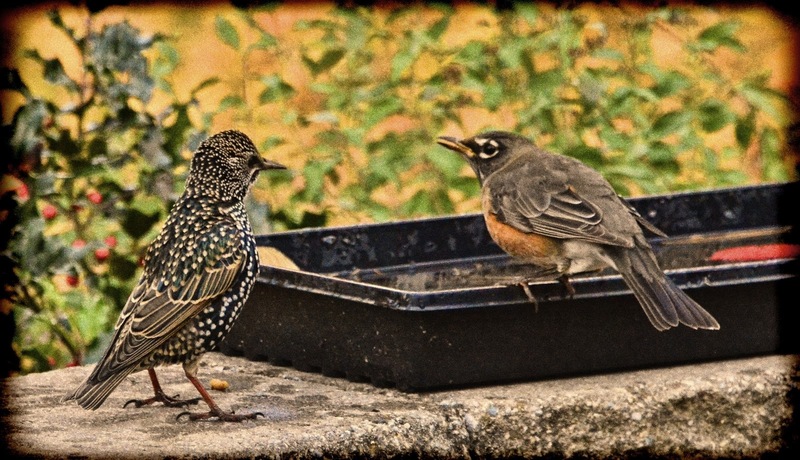 I love the interaction among the birds in these photos. They are just beautiful. Great shots. 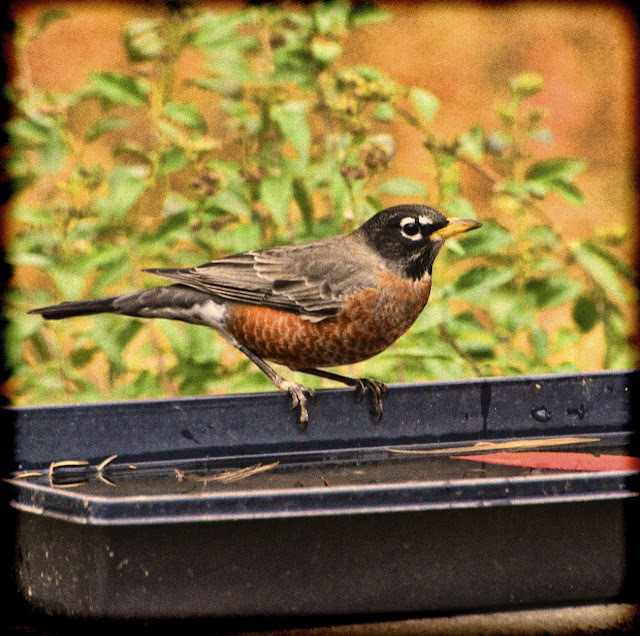 I have a brother named Robin - some friends call him Tweet. Funny nickname for a big guy. So, starlings, that's the name of those birds. I never knew. I see them all the time along with the pigeons on my rooftop. Thanks for sharing story. Cheers!! Love this post, Reena! Great images and great story! It is unusual to see robins at this time of year. Your pictures are great and I the commentary is fun. Love those arguing birds! Great photos as always! A frenzy of Robins is an excellent description. I'm currently thoroughly enjoying the return of the dark eyed juncos!! Love those little guys. 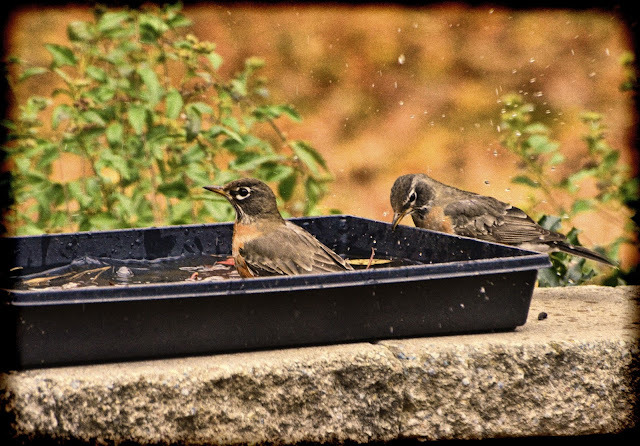 Starting from late october a lot of robins (we call them "pettirossi") arrive here as well. They're simply and lovely. Your photos and stories are always beautiful! 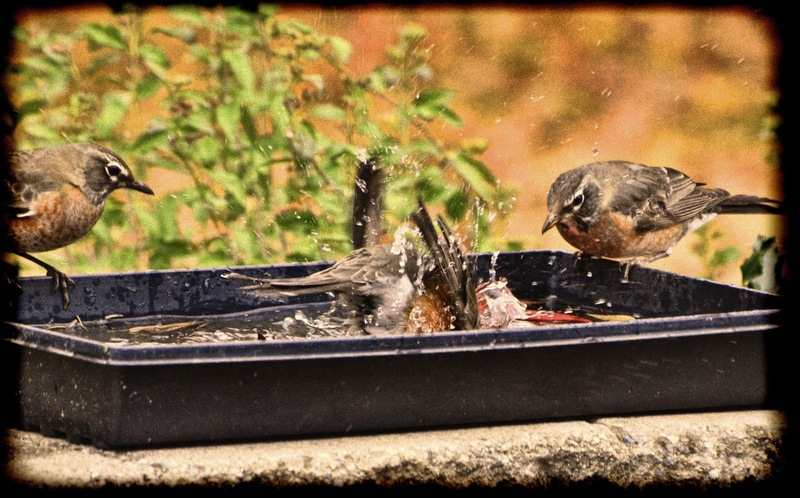 What a joy it must be to sit and watch the bird fighting for there bathes.. I really enjoy just looking at your shots.. I think your editing look fabulous... Hope your having a happy day! Thanks for our daily laugh today! The eighth picture is an absolute scream!!! We are both looking and enjoying. They must be migrating? Starlings never seem to be up to any good, they probably instigated the robin fight! I'm ADORING the first quote and read it aloud to Phil! Great photos and how lovely to have all those birds putting on a show for you. Wonderful images of your lovely robin Reena...so different to ours. I've seen Robins around here all winter long. I think that they will stay if there is a food source. Robins are always entertaining!! Boom & gary of the Vermilon River, Canada. as common as the robins are around here I never get tired of watching them. So much fun to come here and see robins again. It will be April or May before they return here. That argument was just too funny! Wonderful photos! The first one looks like a Chinese painting. grand central station! they are on their out in our parts. Such a lot of life at that watering hole! Amazing action. I love the PP part of digital photography too, I find it kind of relaxing. Your touches are really cool! Cheers! I love all of your robin captures...so pretty with the textures. Oh I LOVE your pics of the Robins!! We have them all year round here so they are a bit under appreciated (in my opinion) LOVE how you captured their "attitude"! 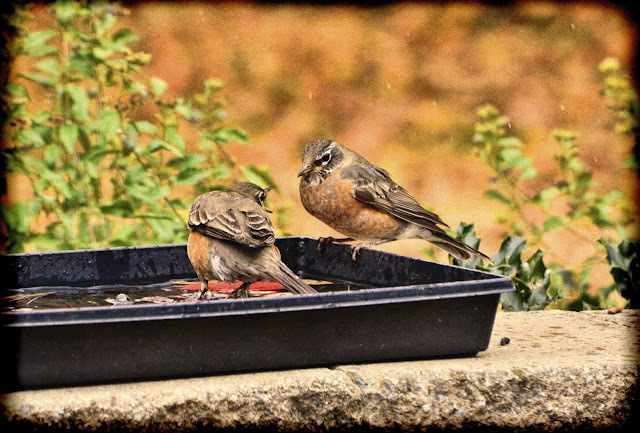 These little Robins must be all mixed up! But look at how much fun you had watching them at the bird bath. Adorable! I love the texture of these shots. those are such cuties for sure! Your birds have so much personality! these photos are smashing!!! I think robin red breast may be my favorite bird. I love the 8th shot with the squawking going on. I see robins here all winter, but they hang out in the woods for the most part. I recently learned that, thinking all these years that they leave for the winter but it isn't so. happy day to you Reena. I have never seen so many robins together. I thought they were territorial? these are fabulous! Perhaps they were migrating? i bet they were happy to find a nice place to stop for a drink and a bath! I could sit and watch this all day long! Thanks for taking such great photos! i cant talk anything about this bird... but, this foto is great..